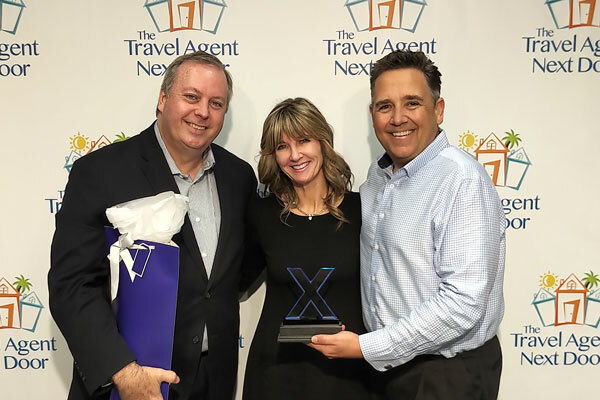 Celebrity Cruises has awarded The Travel Agent Next Door (TTAND) its Celebrity Rising Star Award for 2018 in Canada. The award is given to a newer, upcoming agency. TTAND is an agency that is focused on a true partnership with Celebrity Cruises, one that shows innovative marketing and surpasses revenue and APD expectations. And most importantly, they have a fantastic attitude . TTAND has been exceptional in all of this criteria from the leadership team to each one of the Travel Advisors. They participate in everything Celebrity offers to better their knowledge of its Brand and its ships. Whether it has been Seminars at Sea, Five Star Training Academies, Webinars, Jet Set Fam Trips , promoting and hosting groups, they try it all. The can-do attitude and the willingness to take a is what we love about this agency group. Seen in the photo, from l to r, are Ron Gulasky, AVP National Accounts, Celebrity Cruises; Brenda Yeomans, Strategic Market Manager, Celebrity Cruises; and Flemming Friisdahl, Founder, TTAND.